www.photomacrography.net :: View topic - What is a good amount of stereo separation? What is a good amount of stereo separation? Posted: Tue Apr 11, 2017 11:11 pm Post subject: What is a good amount of stereo separation? From time to time I wonder what a good amount of stereo separation is. If I ask the Internet about making stereo pairs how much separation, I get a lot of hits that to be honest I don't find very useful. That's not surprising, since they're mostly talking about how to shoot large scenes and I usually shoot macro/micro. Large scenes tend to produce narrow angles, simply because our eyes are only about 60 mm apart. If the closest point is 2 meters away, that's only about 1.7 degrees. But in fact my closest comfortable focus distance is more like 0.33 meters, and eyepiece magnifications are computed on the basis of 0.25 m close focus. Using those distances gives separations of about 10.4 and 13.7 degrees. So, what's the right answer? Or maybe that should be what's the "right" answer, recognizing that this question may be like the old joke in which the accountant finally sidles over and whispers,"What would you like it to be?" In truth, most of my posted stereo pairs have been constructed by generating an assortment of separations, which I looked at and simply chose the one I liked best. This is a wonderfully direct way of reaching one goal I always have in mind (making an image that I like), but at the same time it seems a little unquantified, and that makes me twitch a bit. So, here for our collective consideration is a sequence of stereo pairs shot with progressively wider separation. 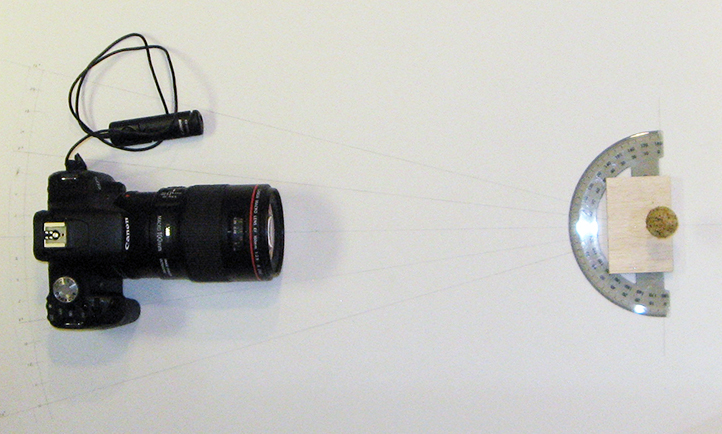 These are true stereo, single frames at f/29 by stepping the camera around a circular track, 2 degrees per step. The subject is a styrofoam sphere, coated with a mix of cooking spices for texture. For myself, the visual impression is that somewhere around 8 degrees is best, 10 is still OK, 12 seems slightly distorted in depth, 14 is starting to look like an American football viewed end-on, and from 16 on out the distortion gets more and more extreme, reaching a definite "Pinocchio's nose" effect at 32. I will be interested to hear other people's impressions. 6 to 8 looks best for me, if best means "round". But I guess that the impression can change if I "train". Idid not know that this effect was so obvious in "real" stereo. In syntetic stereo I usually prefer +- 3. I guess that the adjustment setting perspective in Zerene is important - is it? In practice I usually does not have enough knowledge about the exact shape of the subject to do a correct judgement of the best separation. I agree that the 8-10 degrees pictures look about right for me. If your pupils have a distance of 6 cm between them (like mine) and you look close at an object 20 cm away, your lines of sight will meet at an angle of 9 degrees. So the numbers are not surprising. Using Zerene Stacker for making synthetic stereo I think you have to take the step size and numbers into consideration. In a series taken with many small steps I believe you will get a stronger stereo effect with a certain lateral adjustment between pictures than with a series with fewer and bigger steps. When using magnifications around 3-4x and 70-100 exposures per stack I get the best results using the smallest stereo adjustment step (=1). I'm unable to see cross eye stereos, so I converted them to parallel and looked at them with a mirror viewer. One of the tabs that hold the side ear piece broke off Pocket 3Dvu so I have to hold them by had. I contacted Steve at Berezin Stereo to see if he 'might' have a replacement ear piece. Last I heard from him he was checking with China for a replacement part. Anyway, for me #8 was the perfect one. Posted: Wed Apr 12, 2017 12:39 pm Post subject: Re: What is a good amount of stereo separation? I'm trying to understand. What does the statement above have to do with the plan view of your camera and target setup? 8 for me before the sphere starts to flatten. Just as aside observation, I quite liked the 28 and 32 for depth of just the small area at the center of the cone. I can't see them - can you detail what you mean by converting them to parallel and looking at them with mirror viewer? Is there anyway to train yourself to view these stereo images or am I stuck forever? Cross eye or wall eye I am able to view unaided by a viewer, though I do own a Poke Scope that collects dust by my bug computer. Stereo usually looks good to me. With no viewer I find cross-eye less fatiguing. I usually make/post cross eye as that is the normal format on this forum. My taste runs toward greater separation. I like 12 and 14 deg (in Rik's lineup) a lot and don't mind the oblong vibe that starts at 16 for me. My experience has been that a viewer (stereoscope) can help most folks with viewing wall-eye format, but not all. Some are not able to view it and get it to pop regardless of substantial effort. Once it "pops" and you see the 3D effect it is easier the next time. What a fascinating exercise. My preference is for 12 degrees. This said, as separation rose, so did the requirement to keep my head centered side-to-side and top-to-bottom. At 12 degrees, the sphere appeared spherical only when my viewpoint was well-centered. I have some doubt if this preference is ideal for real-world image posting. It may be biased from the training effect of first viewing this test at small, fault-tolerant separation angles, and unthinkingly applying lessons learned to higher angles. For example, I'm sure that my head kept adjusting toward image centrality with each step up in angle. If posting a single pair, I'm not sure that 12 degrees would work as well as it did here. So 8 or 10 degrees might work better in a real-world posting; it would certainly be more fault-tolerant in terms of head positioning. 1) As separation grows, so does my perception of 3D form, with a seeming increase in information about the shape and texture of the subject. 2) As separation grows, so does the difficulty of fusing the image pair, and the importance of perfect head positioning. 3) For me, when separation reaches a certain point (28 or 32 degrees, my case), I cannot fuse the images at all. Gary, I used to be in your shoes, totally unable to fuse stereo pairs. My advice is to buy the Berezin viewers. You'll find them immediately successful, and will learn what a delight stereo viewing is. If your experience is like mine, after using the viewers a short time, your brain will learn to think in stereo, and you'll find yourself suddenly able to fuse cross-eyed pairs without the viewers. This is what happened to me, at any rate. Would be very interested in hearing if it works the same for you. As mentioned above, it may depend on pupillary distance. I have a giant alien-sized head and wide pupillary distance of 68. I prefer 12 degrees. 10 is ok, but 8 looks a bit flat to my eyes. But yes, positioning is critical at 12 and above. I would guess the sweet spot for most people may be around 9-10. To me, if viewing with bare eyes in CrossView mode - 8 looks best. But viewing it in Oculus Rift Headset(+Virtual Desktop) best is 2. And my IPD is 60mm. Usually i do my stereos using 2 -2 in Zerene. Looks like it depends on many factors such as IPD, scale of the object, zoom, viewing method. Which is headache. Also everyone using their non standardized different devices. I have edited the Synthetic Stereo documentation to include some information about this issue. The calculation gives an accurate correspondence between shift % and off-axis angle. Of course you still have the same underlying problem discussed above, that what makes the "best" angle or shift is a matter of observer preference. But if you're preparing images for publication, and you want to document what the separation is, then for most readers I'm thinking it would be best to pick a viewing angle that both looks good and has some nice round number of degrees, then report the separation as degrees rather than percent. Posted: Sun Apr 16, 2017 1:07 pm Post subject: Re: What is a good amount of stereo separation? Consider an isosceles triangle, with the viewer's two eyes positioned at the base vertices, and the subject positioned at the apex. Stereo separation is the apex angle. In my statement, the base length (eye separation) is assumed to be constant 6 cm, while the height of the triangle varies by changing the distance to focused subject. 0.33 meters to subject gives an apex angle of 10.4 degrees (=2*atan((0.06/2)/0.33)); 0.25 meters to subject gives apex angle 13.7 degrees (=2*atan((0.06/2)/0.25)). In the camera and target setup, it's just the other way around. The triangle height is kept constant (by keeping the camera at a fixed distance from the subject), while the base length changes to match the apex angles drawn on the paper base.